↑ "Meet the Gujarati who went on to become the richest Indian". Daily Bhaskar. 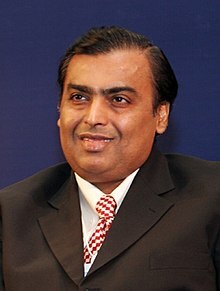 http://daily.bhaskar.com/news/ENT-Mukesh-Ambani-the-gujarati-who-is-now-the-richest-man-in-india-4240139-PHO.html. अन्तिम पहुँच तिथि: 29 January 2014. ↑ "NY Times pics on Mukesh Ambani". The New York Times (India). 15 June 2008. http://www.nytimes.com/slideshow/2008/06/15/business/0615-AMBANI_7.html. अन्तिम पहुँच तिथि: 22 August 2013. ↑ "The World's Billionaires", Forbes, २००७-०३-०८, अभिगमन तिथि २००७-०३-०९, "Year 2007 ."